hen Bryan Ferry performed at Melbourne's Festival Hall in 1977, Mike Brearley was captain of the English cricket team and Jeff Thomson was thundering in off his long run for Australia. Those gentlemen have long since hung up their creams. But Ferry is still at it. On an evening when - surprise! - rain had delayed the start of play in another Ashes Test in England, Ferry was on stage again with the reincarnation of Roxy Music, the band that first made an aural and visual impression in 1971 (the year, incidentally, in which Australia's stand-in Test skipper, Adam Gilchrist, was born). Joining Ferry on stage at the Rod Laver Arena, a fine place for tennis but a barn of a concert venue, were three other original Roxers - guitarist Phil Manzanera, versatile reed player Andy Mackay, and drummer Paul Thompson. Also lining up were six more musicians. One extra and they would have had a cricket team themselves. Reunion shows are always fraught with risk, especially so with a band like this. What was avant garde 30 years ago can now seem awfully passe. For Roxy Music there is another problem: while some of their songs (Avalon, Love is the Drug and John Lennon's Jealous Guy) are still on high rotation on golden-oldie radio, many of their earlier, most influential tracks (Re-make/Re-model, Both Ends Burning, In Every Dream Home a Heartache) are familiar only to those who probably still have the original versions on vinyl. This made for some dislocation in concert: those who came for hits were underwhelmed by the first 45 minutes, which featured mainly early album tracks. These seemed to be of more interest to Ferry and the band, which performed perfunctory versions of some better-known songs (Dance Away; Oh Yeah). A sludgy sound didn't help. Only in the second half of the show, with high-powered renditions of Virginia Plain and Do The Strand, featuring some feathery dancing girls, was there palpable energy both on stage and in the stands. The Roxers appeared unsure quite how to play it: whether to camp it up or be terribly serious about what they do. On Thursday night they tried a bit of both. Ferry himself appeared in no fewer than three guises: black leather suit; white jacket; shiny silver outfit. His vocals were more mannered than ever, even speaking some of the lines in My Only Love. And he didn't inspire confidence by continually flipping pieces of paper on a music stand. At best this was a song list; at worst, motivational notes or the song lyrics. But he appeared to enjoy himself, doing the Aeroplane somewhat self-consciously while the band did the Strand. Ferry's longevity as a performer is remarkable. It should shame all those cricketers. Yet a line from Avalon lingered: "Now the party's over; I'm so tired." Time for the Horlicks, chaps. hen news of a Roxy Music reunion swept earlier this year, quickly followed by an announcement from Brian Eno that he wasn't going to participate, anticipation for the success based on perceived intention was low. As it turned out, that was a good thing, because Roxy Music rocked. The original core of the band Bryan Ferry, Phil Manzanera, Andy Mackay and Paul Thompson, plus keyboards, violins, killer vocals from Sarah Brown and the all important dancers made this one of the shows of the year. Roxy Music returned to Melbourne for the first time in more than two decades last night and chose the very first song from the very first album to open the set. "Re-make / Re-model" showcased a Roxy reinvention from the very first song. When the curtains were opened and the Ferry vocal surfaced, it also highlighted Roxy Music as a band with Ferry taking a backseat on piano and Phil Manzanera and Andy Mackay being the first bodies you saw. Hard to believe the song is 29 years old. "Great to be back in Melbourne" announced Ferry at the end of the song and straight into "Street Life". This was NOT going to be a group of old guys reminiscing. 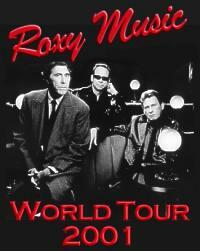 Roxy Music were here to rock. The setlist was made up of a good smidgen of songs from each of the 8 studio albums, with "Ladytron" again from the first album next for show. Ferry thanked his Aussie support act Mishelle Bradford-Jones before jumping to the end of the catalogue and performing "While My Heart Is Still Beating" from their final album 'Avalon'. There is NO dead wood in the Roxy catalogue, they broke up at their peak just after Avalon in 1982. The importance of Manzanera's guitar sound to compliment Ferry's suave vocals was blatantly obvious as Phil sliced his way through "Out of the Blue" and violinist Lucy Wilkins then took the spotlight. Ferry changed from his leather suit into his leisure suit and returned to the stage for the dark "A Song For Europe' and the Flesh and Blood ballad 'My Only Love. Sarah Brown is an amazing vocalist. This woman was pure soul as her voice became an instrument in the Roxy Music band. Legendary guitarist Chris Spedding also grabbed a bit of the spotlight at this point. Then the audience were hammered with true Roxy Musicianship. The epic "In Every Dream Home A Heartache" demonstrated Roxy Music as one of the 70's altime great album selling bands. "Oh Yeah" another one from Flesh and Blood followed (interesting 'Same Old Scene' was not part of the set, nor was "More Than This' for that matter) and then Roxy Music, the party animal surfaced with dancing girls and 'Both Ends Burning'. The introspective instrumental finale to the Avalon album "Tara" came next. It was a showcase moment for Andy MacKay, then Bryan was back for some Roxy Music class - "Avalon", "Dance Away" and Jealous Guy" in quick succession. The era's were covered, the ballads were done and now it was just time to party. "Editions of You" and "Virginia Plain" signaled the singalong section of the setlist for the fans, but it was obvious as they left the stage that the most potent moment was yet to come. The crowd only waited a minute for Roxy to return with their biggest pop hit "Love Is The Drug" and then sign-off tune "Do The Strand" but wait there's more ... The farewell moment was the ballad "For Your Pleasure" with each band member one by one leaving the stage.